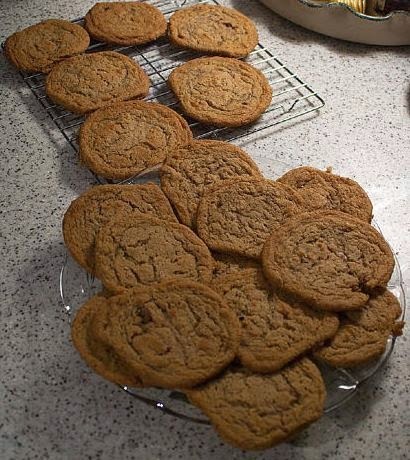 In the early 1970s, when I was very young and with small children to care for, I had a few cookie recipes I would make very often, because they were simple recipes, with ingredients I usually had at hand. Cookies are a terrific snack, don’t require utensils to pick up and eat and can be made ahead for a party. However, even with all that, they are just not my favorite things to make, because they need to be made either by dropping individually onto the baking sheet, rolling out and cutting (making a mess on the counter and more cleanup), or the often added step of having to chill the dough before working. I like immediacy. I want to mix up a recipe, bake it, clean up and be done. One morning I made a batch of these cookies, finally popped the last pan in the oven, and set the timer. Itching to get outside for a bit and see what the children were doing, I went out and got distracted. By the time I remembered the cookies in the oven, they had burnt and shrunken down to tiny little black hockey pucks - not even the dogs had any interest in them! It pays not to get distracted when baking. This was the last straw. I had to think of a better way. I came up with a brilliant idea that I call my Busy Mom Method one I use to this day. Rather than take the time to make all the individual cookies by batches, with separate baking times (and time to get distracted), I would roll the cookie dough directly onto a greased baking sheet, working it evenly to the edges and baking it as one large cookie. It is best to use a baking sheet that has three open sides, as it is simpler to maneuver the rolling pin and get the cookie rolled evenly. Keep in mind also, that a little more flour may be needed in the dough to allow for lifting it out and forming into a rough rectangle for rolling. Also, a little extra flour over the surface while rolling helps to keep the rolling pin from sticking. Try not to add any more flour than absolutely necessary, or the cookies will come out denser and harder. It takes a few minutes more in the oven with one large cookie, but it comes out perfectly. Just watch for the edges to be golden, and the center to be set. With these cookies, I also make a simple icing that is just 1 1/2 cups of confectioners' sugar, a pinch of salt, 1/2 teaspoon of vanilla and enough water or milk to make a relatively thick consistency (very slow to fall from the spoon). Spread this over the hot cookie straight from the oven. The hot cookie warms the icing, making it melt and spread easily, using the back of the same spoon I used to mix the icing. I am all for less cleanup! Once the cookie cools, the icing dries and hardens, and I just cut the large cookie into small bar or square shapes, and voila; cookies in half the time! Two of my favorite recipes for this method were Hermits and Simple Vanilla Cookies. If you are a busy mom, try this method with any simple cookie dough. The Hermit cookies had raisins in them, but the thickness of the dough was no less than the thickness of the raisins, so it still worked well. Cream butter, shortening and sugar. Add vanilla and salt. Add eggs, one at a time, beating well after each. Stir in flour, mixing well. Drop from a teaspoon 2 inches apart on a greased cookie sheet. Flatten with floured, flat-bottomed glass. Bake in a 375 degree oven for 8 to 10 minutes. Remove immediately from pan. These Simple Vanilla Cookies are incredibly good, from such a simple recipe. Don't take my word try them out, either as individual cookies, or with my Busy Mom Method.